Motto turns matcha, the traditional Japanese tea, into a tastier, cold sparkling drink. 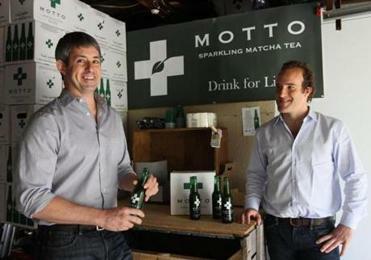 Motto sparkling matcha tea is the brainchild of Tom Olcott (left) and Henry Crosby. 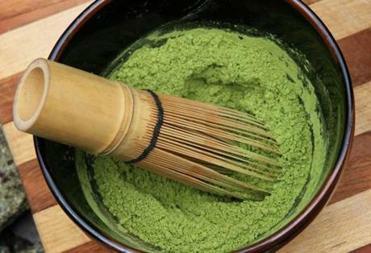 Matcha is an ancient powdered form of green tea leaves used as part of the traditional Japanese tea ceremony. The leaves are finely ground, then whisked into hot water. Fans like Tom Olcott believe that the tea provides a high-powered dose of antioxidants. “You feel good as soon as you have it,” says Olcott, an architect by training. The green tea has a small following. 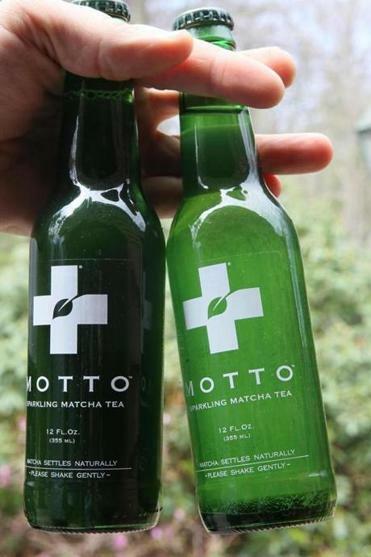 But Olcott, who turned matcha into a sparkling drink, hopes his new beverage, Motto, will transform the iced tea industry. Olcott, 33, a Deerfield native, created Motto somewhat accidentally while working on an architecture project on Nantucket nearly three years ago. At the time, he often experienced midafternoon malaise and began drinking hot matcha on his brother’s recommendation. One day, the tea cooled, and Olcott added apple cider vinegar, honey, lemon, and sparkling water to enhance the flavor. “The idea was to keep the beverage simple and healthy,” says Olcott, who teamed up with a friend, Henry Crosby, 30, who had just finished law school and shifted gears to devote his efforts to Motto. “Traditionally [matcha is] a little bit of an acquired taste,” says Crosby, who set up a home office operation in Boxford while the drink gains traction. “It’s earthy. We put a little tastier spin on it.” Getting customers to buy Motto requires convincing them they’ll like matcha, a task that has been slow but steady. Olcott believes the drink, which is produced in Pennsylvania, is like its name: “something to live by.” Olcott, who no longer does architecture work, thinks that matcha, and the drink, will take off.“There’s a wave coming and we want to be at the right place,” he says. The traditional Japanese tea is made from ground-up whole leaves. Motto seems to measure up. It comes in a dark green 12-ounce bottle and costs $3.50. The ground-up leaves settle at the bottom, requiring a gentle shake before opening. Steve Napoli, owner of Snap Top Market in the South End, was one of the first retailers to offer Motto. The price, he says, is about “a buck more than most other beverages,” but doesn’t seem to intimidate customers. “They love it when it’s ice cold,” says the retailer. “It’s like eating a cold cucumber in the summer.” The green grocer tells customers, “Don’t judge it on the first sip. Get halfway down.” And then Motto sells itself. 617-250-2825; Foodies Urban Market, 1421 Washington St., Boston, 617-266-9911; Harvest Co-op, 3815 Washington St., Jamaica Plain, 617-405-5300. Correction: Because of a reporter’s error, an earlier version incorrectly referred to Harvest Co-op.